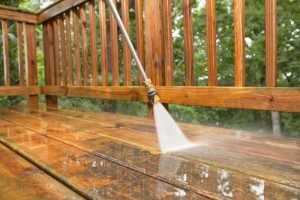 Our deck power washing service will get your deck looking like new! Decks endure constant exposure to the elements. Over time, this exposure really begins to show on deck exterior appearances. Dirt, grime, pollen, and mold on your deck will do more than make it look unkempt. These elemental hazards can even lead to corrosion and breakdown on your deck surfaces. The outside of your deck gives an important first impression to your entire property. Decks are too much of an investment to allow outer appearances to diminish over something that can easily be remedied with our deck power washing service by Beyond Carpet Cleaning. Our professional deck power washing company can protect your deck from weather destruction. We know how to remedy dirt buildup and discolorations. We are careful to use precisely the correct pressure levels for each part of your deck exterior. We take pride in our work and specialize in detailed cleanings of all outer deck surfaces. Our professional deck power washing services give new life to all exterior residential areas. Don’t attempt to clean your deck on your own. Regular garden hoses lack the pressure required to properly eradicate exterior buildup, and the task can be time consuming and overwhelming. Beyond Carpet Cleaning has the correct tools and knowledge to safely and efficiently handle any deck power washing assignment. Contact us today!